Looking for the best gas tankless water heater – well, you’ve come to the right place! The market has exploded in recent years, with a proliferation of instantaneous or on demand tankless water heaters that can supply enough hot water for any whole home system. The problem is: there are just too many of them. When you have that many tankless water heaters, there’s an awful lot of units you need to wade through to find what you’re looking for. Thankfully we’re here to alleviate the pain and deliver a definitive list of the best gas tankless water heaters the market. (P.S. This guide is for tankless gas water heaters, not electric; if you’re looking for electric tankless water heater, check out this guide). When it comes to tankless water heaters, Rheem is probably one of the most legendary. They were established in 1930, and they have been making quality water heating products ever since. Rheem makes some of the best natural gas tankless water heaters in the world. We’ve come across a ton of you who have used and swear by Rheem tankless water heaters – particularly gas-powered ones. However, these gas tankless water heaters are quite expensive. If you want to go balls-to-the-wall and actually buy one of these units, you’ll be looking at a $1000-$1400 price tag. However, you’ll be getting a solid tankless water heater that will last a very long time supplying enough hot water for simultaneous multiple uses in your home. While the typical storage-tank water heaters are estimated to last 10-15 years, tankless water heaters have a longer lifespan and are estimated to last up to 20 years. The RTGH-95DVLN is one of the best indoor natural gas tankless water heater that Rheem has to offer. 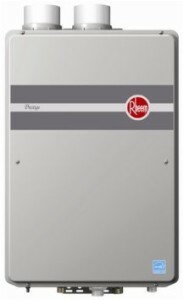 Rheem Prestige™ RTGH is a series of powerful, high efficiency condensing tankless gas water designed and built from the ground up with quality in mind. These water heaters use condensing technology that allows them to be the most efficient whole home tankless water heating solution at 0.94 Energy Factor. They are fitted with a self-diagnostic system as well as a digital display shows temperature setting and maintenance codes. There’s also a remote control panel that can be used to set the output water temperature and subsequently could possibly display fault codes. If I had to nitpick Rheem Prestige™ RTGH series of tankless water heaters, it would just be the price – something this good is naturally expensive.However, we do think you get a lot of bang for your buck with these water heaters. 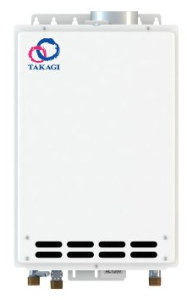 The Takagi T-KJr2-IN-NG is one of the most reasonably priced gas tankless water heaters on the market. While most gas tankless water heaters are priced at over $1000 easily, the T-KJr2-IN-NG gets the job done for almost half the price. That’s part of what makes it so appealing. However, the T-KJr2-IN-NG does not forfeit quality for price. 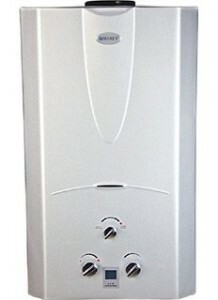 It’s one of the best gas tankless water heaters at this price point, all thing considered. The T-KJr2 comes in two different condiguration, the IN-NG model for indoor use, and the OS-NG model for outdoors. The indoor version (T-KJr2-IN-NG) is the smallest unit in the Takagi line-up. It is highly portable and convenient to install just about anywhere. However, It’s best suited for relatively low-flow applications (e.g., bathroom faucets, kitchen sink) or a couple moderate-flow applications (e.g., a shower and clothes washer). It can deliver a maximum flow rate of 6.6 GPM (gallons per minute) at 35°F temperature rise, and 3.3 GPM at 70°F rise. The T-KJr2-IN-NG is equippped with various safety features including Air-Fuel Ratio Sensor (AFR), Exhaust and Water Temperature Safety Control, and Overheat Cutoff Fuse. It also comes with a remote control panel for extra comfort and convenience. If you have a 40 (or less) gallon tank-type water heater and you’re wanting to replace it with a tankless gas water heater without breaking that bank splurging on the most expensive tankless water heater, then the T-KJr2-IN-NG is great unit worth considering. Rinnai is a Japanese corporation based in Nagoya. They specialize in manufacturing gas appliances. They have been in this industry for almost a century. Rinnai is one of our most-reviewed tankless water heater brands. They’re a company known for their long tradition of making quality products and their tankless water heaters line is no exception. The RL94iN is a great indoor natural gas tankless water heater rated for 9.4 gallons per minute and 0.82 energy factor. It features a sleek, modern design with silver finish and sculpted cover. It can be installed and used individually, in pairs, or in banks of multiple water heaters to supply all your hot water needs. The RL94iN is capable of fulfilling the needs for hot water of a relatively large family living in a medium sized home. 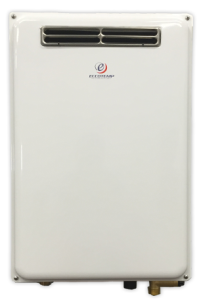 The RL94iN is ENERGY STAR® qualified gas tankless water heater. Rinnai condensing technology allows for maximum energy-efficiency. Rinnai on demand water heaters are some of the best energy-efficient tankless water heaters we’ve come across. They are designed to use up to 40 percent less energy than tank-type (storage) water heaters. The downside, however, is its hefty price tag. If you want to buy one of these tankless water heater, you have to shell out some serious dough. Marey is a brand that we haven’t discussed much on our site. However, Marey has made a name for themselves in the water heating industry. Their tankless water heaters are very reasonably priced, and they work well for the amount you pay for them. That’s part of what makes them so appealing. The Marey Power Gas 10L NG’ compact design will save you valuable space and allows for easy installation in just about anywhere. These water heater come in two varieties: propane and natural gas. We are not going into debate about which is better, because they both clearly work, and it really boils down to personal preference. Whether you decide to opt for propane or gas powered unit, the performance of both units are identical. The Marey 10L has a capacity of 2.7 GPM (gallon per minute), which is about 10 LPM (liters per minute). It’s better suited for low water flow application such as bathroom faucets, kitchen sink, shower…etc. The Marey 10L uses an automatic electrical pulse igniter with no standing pilot light. The igniter operates on two D-cell batteries. So no electrical hookup is required. The Marey 10L features three control large knobs on the front. Two of them for controlling gas and water flow, and the third for – winter/summer knob – allows for more control over water temperature by opening gas to additional burners inside the unit. 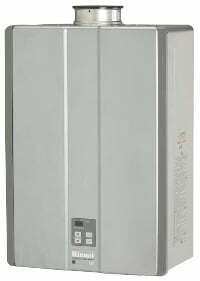 This tankless water heater units comes with multiple safety features such as gas leak and overheating safety controls, flame failure safety sensor, high-pressure relief valve, and an anti-dry combustion safety device. If you’re on tight-budget or if you’re living in a small apartment and looking for a tankless water heater that doesn’t cost an arm and a leg, then Marey Power Gas 10L is your best bet. It’s one of the best natural gas tankless water heater under $300. While most high-end tankless water heaters ou there require 3/4″ gas lines, this unit uses only a 1/2″ gas line. That’s good news if you want to avoid the additional cost that might come with upgrading your gas line. 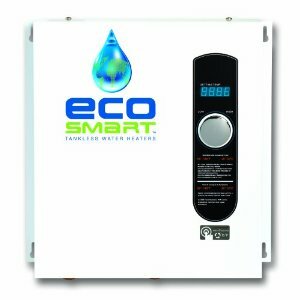 Eccotemp is one of the best manufacturer of tankless water heaters out there (their portable tankless water heaters in particular seem to be well-liked). The Eccotemp 45H-NG is an outdoor tankless water heater. It’s the largest outdoor model of the Eccotemp tankless water heaters line. The Eccotemp 45H-NG is the outdoor equivalent to the Eccotemp 45HI-NG indoor tankless water heater. Both, the indoor and the outdoor versions are indentical in terms of performance. They also cost the same. The Eccotemp 45H-NG is rated at 6.8 GPM flow rate at 35 F temperature rise. And at 70 F temperature rise, it can deliver up to 3.4 GPM. That’s quite impressive considering its price. It’s the ideal choice for any medium sized home or apartment with one or two bathrooms, as well as any other low flow applications.